Quick house update! Our current home is now under contract, and we should be closing March 1st. We've started lots of work on the new place (plumbing repairs, adding recessed lighting, and expanding the master closet space). We ordered appliances and an area rug, and I've started work on Mae's bedroom: painting and installing trim boards. Even if everything else is a complete mess when we move in, I'd really like to have Mae's room in order. Hopefully that will reduce any stress and homesickness. 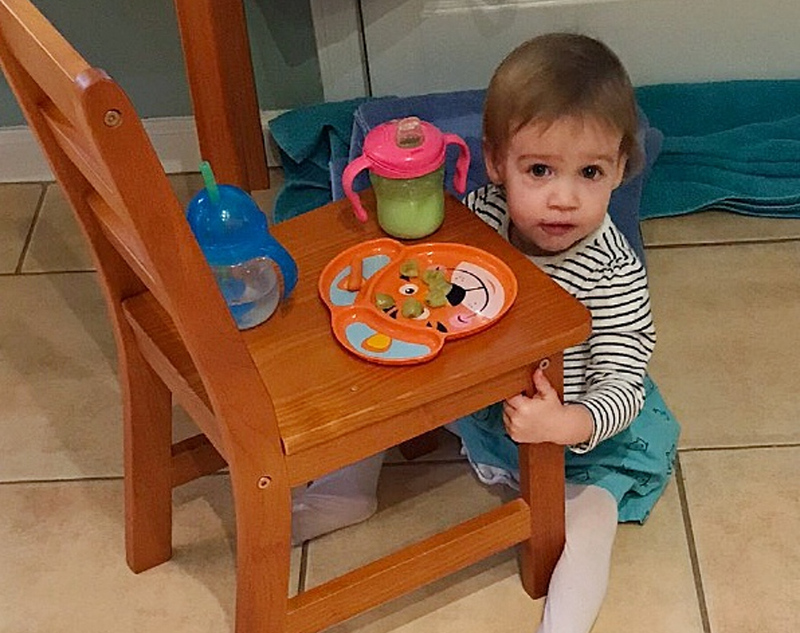 Who really knows how well a toddler will understand something like this? As if everything wasn't crazy enough at home, I spent all last week at our corporate training center just outside New York City! On one hand, it was very challenging spending all day in classes and being away from home during such a busy time. On the other hand, it was like a mini-retreat having so much time to myself! I woke up early every morning to enjoy the free fitness classes (kickboxing, spinning, and yoga) and stayed up late every night to hang out with my colleagues at the on-site bar. Dan and Mae managed just fine without me, though Mae cried when I tried to FaceTime her the first few days. I got a text from Dan on Thursday morning saying that he had overslept and then later spilled water all over his pants at work. The next text said, "Apparently the answer is: 3. I can handle 3 days without you before everything just goes to s***." On Friday morning, I talked a few colleagues into an early morning run to a nearby dam. Two of us turned around about half way to our destination in order to have ample time to shower and get ready for class, but one guy wanted to make it all the way to the end. Earlier in the week, our instructors had implemented a rule where anyone late to class had to perform some embarassing task at the front of the entire 100-person group. I told the ambitious runner that if he was late to class because of our run, that I would join him in his task. Our rendition of the chicken dance later that morning was magnificent! Friday afternoon, Dan flew in to spend the weekend with me in New York City while Mae stayed home with Grandma. 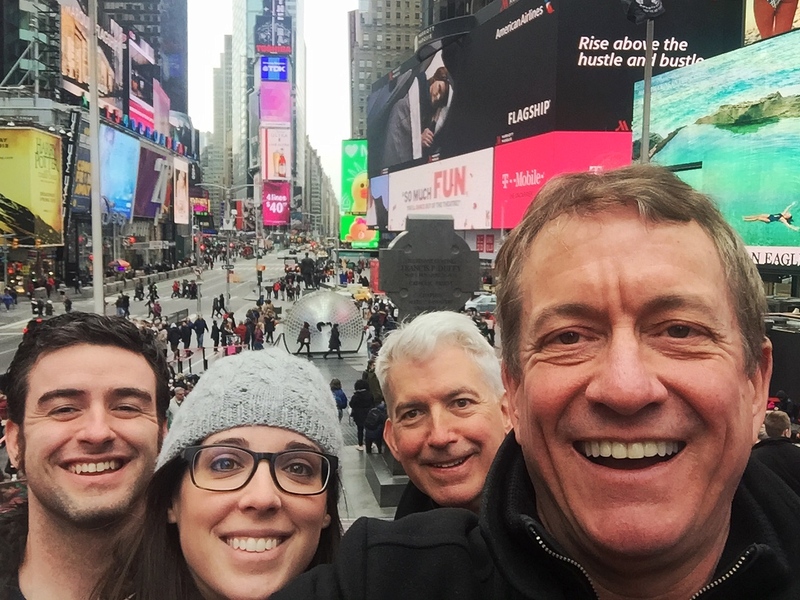 We were excited to visit family and have a little time to see the city! We stayed with his uncles Jim and Ed in their gorgeous apartment in Manhattan. On Friday evening, the four of us went to Brooklyn to join Tim and David for dinner and see their apartment. I loved seeing Brooklyn for the first time! Saturday morning, I slept in (a bit) and then went for a long run through Central Park and along the Hudson River. I have been to the city a few times, but had never been in Central Park before! The weather was chilly and beautifully clear, so there were lots of runners, cyclists, and dog walkers out. Definitely a bucket list item for me! Later in the day, Tim and David met us for a trip to the Museum of Arts and Design (MAD). Many of the exhibits were centered around sound and music, so there were lots of interactive exhibits and cool things to play around with. I loved it! 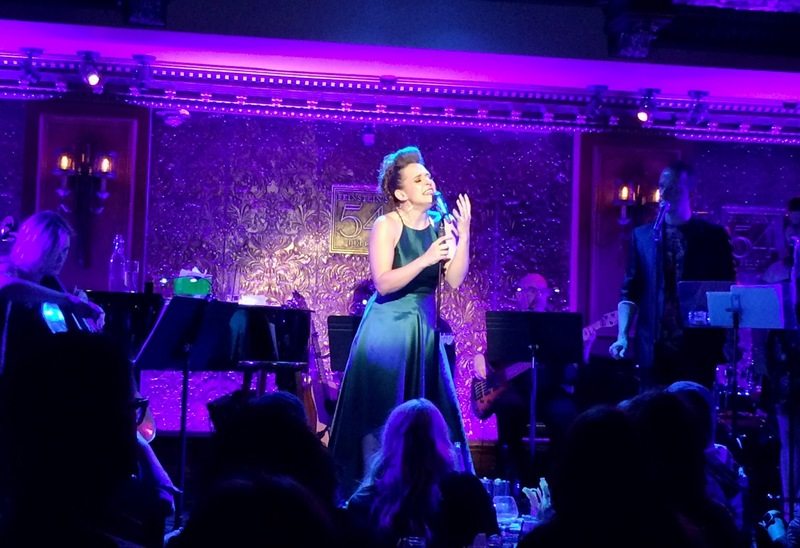 In the evening, Jim and Ed treated us to dinner and a performance by Jessica Vosk (formerly Elphaba from the touring cast of "Wicked") at a nearby venue 54 Below. 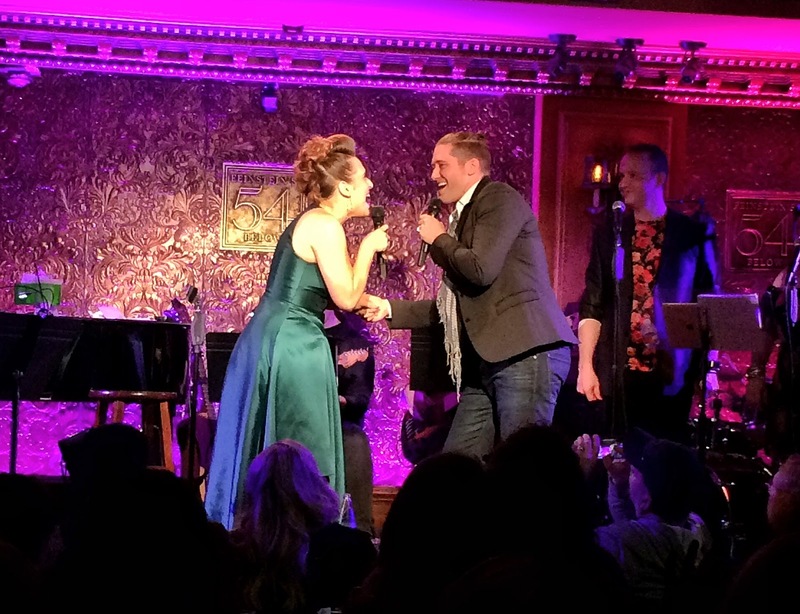 She sang a mix of Broadway and pop songs and we were thoroughly entertained by her powerful voice and witty banter. We had amazing seats, likely due to Ed's complaint about less-than-stellar seating at a previous performance by Matthew Morrison (best known as the teacher from Glee.) So, we found it especially hilarious when he popped out of the audience and performed a duet with Jessica part-way through the show! Sunday morning, we went to church at St. Patrick's Cathedral. I'd seen it from the outside but never appreciated just how massive and grand it is until this weekend. Afterwards, our hosts treated us (again!) to a delicious breakfast near Times Square. They don't spend many of their weekends in the city, so it was fun for us all to be tourists together! Thanks for an absolutely amazing weekend, Jim and Ed! While Dan and I were off gallivanting around the Big Apple, Mae and Grandma were enjoying their weekend together. Dad and Kevin came to visit on Saturday also. Grandma spoiled Mae with trips to story time, an indoor playground, and the toy store, where she got some new fridge magnets! Mae was a good eater all weekend (even if some of her snack locations were a little creative). Thanks for taking care of our busy little girl, Grandma!